VR-Zone reports (via Hardmac) that Intel has begun production of its new "Z68" chipset for Sandy Bridge-based processors, with availability set for May. Most notably in light of rumors regarding the new MacBook Pro that failed to materialize, the Z68 chipset will support Intel's Rapid Storage Technology SSD caching. 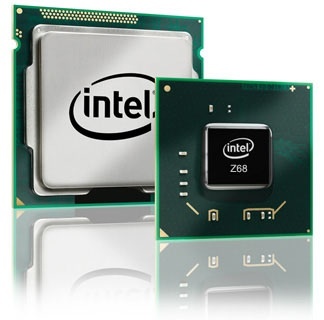 Interestingly, Intel has also started production of their Z68 chipset this week along with other Cougar Point SKUs like H61 and Q65. All of them are based on the new B3 stepping therefore the SATA port 2-5 issue is fixed before they hit the market. Judging from the specs, it seems Intel has catered Z68 specially for enthusiasts which allows better processor overclocking, discrete graphics support and SSD caching capability. SSD caching marries a conventional hard drive to a relatively small solid-state drive (SSD), with the most frequently-accessed data automatically placed on the SSD for fast access while the two drives appear to users simply as a single drive. The functionality serves to bring users much of the speed benefit of SSDs but with the storage capacity and lower cost of traditional hard drives. Several rumors in the days leading up to last week's MacBook Pro refresh claimed that the updated models would offer a dedicated SSD to host the operating system and other essential files. The claims did not, however, come to fruition. 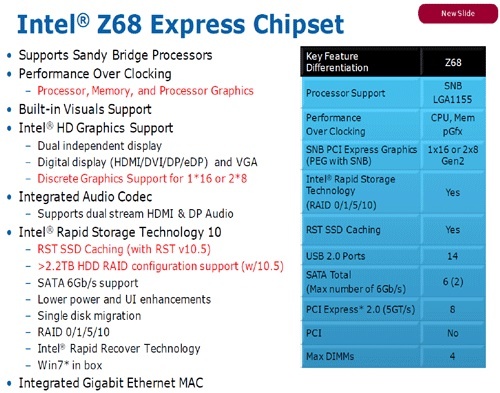 Update: To be clear, the Z68 chipset is for desktop implementations. Obviously nobody remembers Turbo Memory. This is just embedding it into the board. It did very little to improve performance and actually hurt performance in several areas. I don't think it's really valid to draw conclusions on this from that. SSD performance - and in particular size - have come a long, long way since then. This is basically an attempt to implement ZFS's L2ARC and (hopefully) ZIL in the chipset. IMHO this is the best usage of SSDs at current (and near future) technology levels and I've been waiting for other OSes/filesystems to implement it for years (Microsoft kind of did with Vista's/7's ReadyBoost, but you can't use regular SSDs and it doesn't cache writes). Per those that say just get a SSD, this would still be beneficial. You could have small (4GB?) super fast SSD's (think almost RAM speeds) using the new caching tech, and have a regular-speed SSD (80GB) for your "regular" data. That would provide the best bang for the buck. Better to just spend the money on 4GB more RAM. This sort of thing really needs 10s or 100s of GB of SSD to be effective. The real problem (from a marketing perspective) is that it's extremely difficult to benchmark, since it requires some time (anywhere from hours to days of representative usage) for the SSD cache to properly "warm up" before the performance benefits are seen. Why do we need a new chipset to support SSD Caching? It seems like this could be done with software on the OS level... Windows can already do this, can't it? The OS level is the best place to do it (because it knows about the filesystem, not just blocks), but OS vendors are dragging their feet. Vista and 7 have this somewhat implemented with ReadyBoost, but the real standouts are the OSes using ZFS. One TB port may be fine for a laptop but but a couple of years down the road and desktops will find the need for more than one port. Laptops may never have that need but that is no surprise. I disagree. Laptops are _exactly_ where TB can be most useful due to their physically constrained expansion options. I'm hoping future Apple laptops - particularly the Air - will soon come with at least two TB, if not three or more, TB ports. Exactly the question I had. I assume a hardware solution may be optimal but even a software solution should be able to provide a big improvement over current solutions (similar to hardware raid versus software raid). The "optimal" solution for both these things (caching and RAID) is in software, not hardware, because the OS has greater insight into the structure, type and frequency of data being accessed, and can hence make more intelligent decisions about how to improve performance.